Precious metals products are essential materials in the functionality of many familiar products used in our daily lives. They hold unlimited potential in the development of advanced technologies. 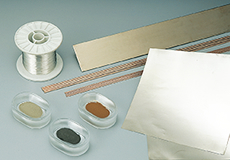 TANAKA provides a broad range of precious metals products in a variety of shapes and sizes. With our processing technology, we can supply various sheets and wires that take advantage of the characteristic of precious metals so they can be rolled into wide, thin, long, and fine sheets. Complete quality control of composition, size, surface condition, etc. Electrical components, Semiconductor devices, Ornaments, Music instrument parts, etc. *Tanaka fabricates precious metals products in a wide range of shapes and compositions. Upon a customer's request, we can supply thick film paste, submicron powder for use as catalysts etc. and millimeter-sized precious metal powder for powder metallurgy etc. with various production methods, such as wet and dry methods. Atomization, wet reduction, electrolysis, mechanical processing, etc. Thick film pastes, conductive materials, photosensitive materials, magnetic materials, electromagnetic shield, special paints, catalysts, synthesized compounds, anti-bacterial materials, electrode materials, electric contact materials, powder metallurgy, etc.